Classic and fashion sheets and sheet sets in colors to coordinate with your bedding. Add crisp classic style and next-level comfort to any bedding ensemble with the soft cotton and luxe 800-thread-count design of these Ultra Fine sheet and pillowcase sets from Charter Club Add luxurious comfort to your bedroom with the Sleep Luxe Fashion Hem sheet sets from Charter Club, featuring the unmistakably soft touch of cotton sateen and the striking look of a colored hem set against a white sheet. The Ultra Fine sheet collection by Charter Club features the soft touch of 800-thread count cotton, making it the choice for ultimate comfort. Experience cozy comfort and chic style with the Sleep Luxe duvet cover collection from Charter Club, featuring the irresistibly soft touch and lustrous sheen of cotton sateen and a charming printed design. Experience cozy comfort and chic style with the Sleep Luxe sheet set from Charter Club, featuring the irresistibly soft touch of cotton sateen and a charming printed design. Fabric: 100% Cotton Thread count: 800 Experience cozy comfort and chic style with the Sleep Luxe duvet cover collection from Charter Club, featuring the irresistibly soft touch and lustrous sheen of cotton sateen and a charming printed design. Upgrade any bed's comfort with the incredibly soft Egyptian cotton and luxe 700-thread-count styling of this sheet set from Charter Club. Bring a refreshing look and feel to any bedroom with the Sleep Luxe Dobby Dot extra deep sheet sets from Charter Club, featuring the unmistakable comfort of Egyptian cotton and a charming dobby dot design. Add fresh style and comfort to your bedroom with these 600 thread count Sheet Sets from Charter Club featuring a smooth sateen weave and a solid pattern. Each set includes one flat sheet, one fitted sheet and two pillowcases. Beautify your bedroom with the Damask Designs Wovenblock sheet set from Charter Club, featuring the luxuriously soft touch of Supima cotton and a relaxed basketweave pattern. Instantly elevate any bedding ensemble to a whole new level of sleep style and comfort with the irresistibly soft Supima cotton and lustrous stripes of this Damask sheet set from Charter Club. Instantly elevate any bedding ensemble to a whole new level of sleep style and comfort with the irresistibly soft Supima cotton and luxe 550-thread count of this Damask sheet set from Charter Club. Instantly elevate any bedding ensemble to a whole new level of sleep style and comfort with the irresistibly soft Supima cotton and luxe 550-thread count of this Damask extra-deep sheet set from Charter Club. Give your classic bedding a boost of style and comfort with these Damask Designs 500 thread count printed sheet sets from Charter Club, featuring soft pima cotton fabric and a wrinkle-resistant design. Combine patterns to create your own unique look. 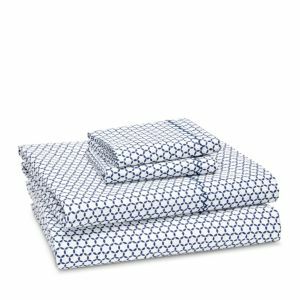 GGive your classic bedding a boost of style and comfort with these Damask Designs 500 thread count printed sheet sets from Charter Club, featuring soft pima cotton fabric and a wrinkle-resistant design. Combine patterns to create your own unique look. Add a luxe layer of style and comfort to any bedding ensemble with the super-soft cotton and quilted diamond pattern of these Damask coverlets and shams from Charter Club The super-soft brushed cotton and single ply 300-thread count of this sheet set from Charter Club make it the perfect choice for classic style and comfort. In incredibly soft cotton that gets even cozier after each wash, these SleepSoft yarn-dyed sheet sets from Charter Club are the perfect choice for refreshing any bedding ensemble. Mari Ann Silk offers a naturally hypoallergenic collection of sheets crafted from the finest mulberry silk. Each sheet is made with amino acids that nurture the skin and is incredibly soft to touch for a luxurious bedtime experience. Mari Ann Silk offers a naturally hypoallergenic collection of sheets crafted from the finest mulberry silk. Each sheet is made with amino acids that nurture the skin and is incredibly soft to touch for a luxurious bedtime experience. Mari Ann Silk offers a naturally hypoallergenic collection of sheets crafted from the finest mulberry silk. Each sheet is made with amino acids that nurture the skin and is incredibly soft to touch for a luxurious bedtime experience. Featuring a rippling waterfall print, the Oake Cascade sheet set is crafted from luxuriously crisp 400-thread count cotton and brings modern style to any bedroom. 300-thread-count Egyptian cotton. Machine wash. Made in the USA of imported fabric. An Indian tile print in rich indigo adorns these crisp, 200-thread count cotton percale sheets from JR by John Robshaw. A zigzag stitch accents the cuff of the flat sheet and pillowcases. UGG sheet set includes fitted sheet, flat sheet, and two pillowcases. Linen with raw edge hem. UGG sheet set includes fitted sheet, flat sheet, and two pillowcases. Linen/cotton. UGG sheet set includes fitted sheet, flat sheet, and two pillowcases. Cotton. 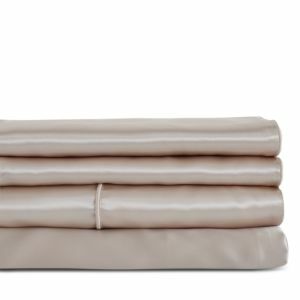 UGG sheet set includes fitted sheet, flat sheet, and two pillowcases. Cotton. UGG sheet set includes fitted sheet, flat sheet, and two pillowcases. Cotton. UGG sheet set includes fitted sheet, flat sheet, and two pillowcases. Cotton. When it comes to sheets, we think a double set — especially with a monogram — makes an impressive shower, wedding, or housewarming gift. These are made of 600-thread-count Supima cotton and come in White or Ivory 300-thread-count white cotton percale flat sheet and pillowcases have 7" embroidered cuffs. Percale has a tight, uniform weave that results in a smooth, crisp feel and matte look. 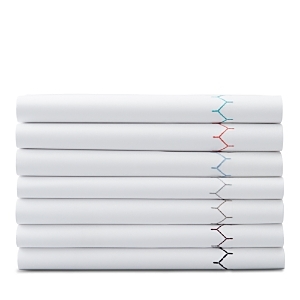 Ultra smooth, 300-thread-count cotton-percale sheeting edged with simple stitching in a range of colors pairs perfectly with bedding in any variety of patterns or solids. Crafted in soft, 500-thread count cotton sateen, these solid sheets by Sky are available in a range of hues perfect for mixing and matching with printed bedding Crafted in soft, 300-thread count organic cotton, these Bloomingdale's Essentials sheets feature a subtle tonal dobby stripe design. Create a relaxed sleeping environment in your bedroom with the Dobby Stripe sheet set, featuring a soft cotton fabric and a soothing stripe pattern. Give any bedding ensemble a next-level feel with the luxe 500-thread-count sateen of these stylish Norvara sheet sets. Add the smooth touch of sateen to your room with the Norvara printed sheet set. 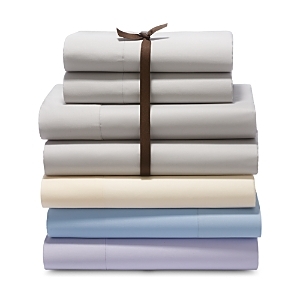 Each set includes one flat sheet, one fitted sheet and four pillowcases. 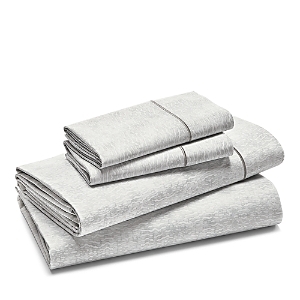 Enjoy the smooth sateen feel of the Emory sheet set, featuring a luxe 420-thread count. Each set includes one flat sheet, one fitted sheet and two pillowcases. Add some lasting style and luxurious comfort to any bed with the exceptionally soft and strong Suvin cotton and lightweight, breathable design of this AirFeel 350-thread count sheet set. Refresh your bedding essentials with the stylish hues and super-soft 350-thread count of these classic Bari sheet sets.